I-CAR®, the Inter-Industry Conference on Auto Collision Repair, announced today the recipients of its annual I-CAR Awards, which recognize individuals who have made outstanding contributions to advancing technical education and professionalism in the collision repair industry. The recipients were revealed at a special ceremony at the Westgate Las Vegas Resort and Casino during the 2018 SEMA Show. The Russ Verona Memorial Award, honoring an I-CAR Gold Class® shop that actively promotes technical training and a positive image for the collision repair industry, was awarded to CARSTAR Mundelein in Mundelein, Illinois. The business and its longtime owners, Jeanne and Jeff Silver, were selected for their extensive industry involvement, dedication to training and promotion of career opportunities at numerous schools in their local community. Both of the Silvers have also served in a variety of key positions within the collision repair industry, earning numerous awards and accolades over the years. CARSTAR Mundelein has been a Gold Class® recognized shop since 1996. The Jeff Silver Award, which honors an I-CAR Platinum™ individual who demonstrates true passion for training and professional growth, was given to Rick Cope of Cope Collision Center in Meridian, Idaho. Cope serves as the I-CAR chair for Southwest Idaho, is an advisory member for the College of Western Idaho Auto Body Technology program and is a member of the Idaho Autobody Craftsman Association. He is a strong proponent of continuing education, and encourages local students to pursue co-op and full-time opportunities at his shop. Cope Collision Center has been a Gold Class recognized shop since 2007. When scanning became necessary for today's well-trained collision repair technicians, the focus of your shop split. 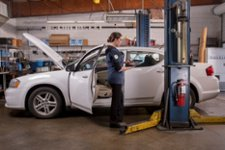 If you aren’t training for vehicles scans, your techs aren’t fully prepared.